Circle packing is a classical topic in discrete geometry. As Axel Thue and László Fejes Tóth showed, if you want to fit as many identical circular coins on a table as possible (all sitting side by side, no piling up or overlapping), the best you can achieve is for around 90.7% of the table to be covered. This is done by arranging the coins along a hexagonal lattice. That was an interesting result, and can be lifted into higher dimensions in the even subtler science of sphere and hypersphere-packing. That’s fine, but we can pose the same problem, using coins which are not circular. Now here is an interesting question: which shape is the worst packer? The question is only sensible for convex shapes, and we further assume that the shape is centrally symmetric. 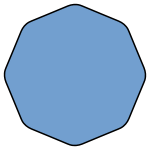 Then the answer is conjectured to be the smoothed octagon, with a maximum packing density of around 90.2%. The smoothing is done by rounding off each corner with a hyperpola which is tangent to the two meeting sides, and which asymptotically approaches the two sides beyond those.